Across three major manufacturing locations in Northern Ireland, Italy and the Netherlands, quality Hyster® trucks, from warehouse equipment to container handlers, are being made in Europe. 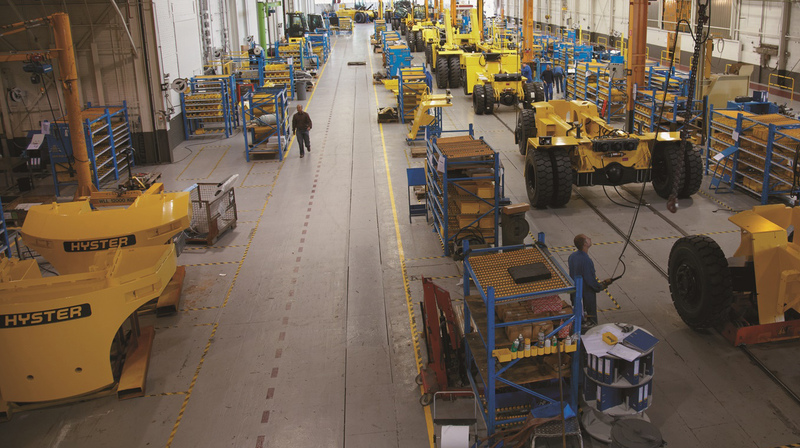 Hyster® Company uses global expertise and resources to ensure that all components are produced and all trucks are assembled to the same worldwide quality standards. While each site across Europe uses specialist expertise to produce different types of truck, all use outstanding manufacturing technology and state of the art processes to ensure that quality is built-in whenever you buy a Hyster® truck in Europe, the Middle East or Africa. For example, Demand Flow Technology (DFT) provides the ability to produce any model, any day, based on customer demand. As opposed to checking quality at the end of the truck build, with DFT, quality checks form an integral part of the assembly process, driving built-in quality. ICE counterbalanced forklift trucks (pneumatic tyred) –The H1.6-2.0FTS, H2.0-3.5FT, H4.0-5.5FT, ideal for the most demanding applications. Also, the recently introduced H2.0-3.0XT series, built with the same quality approach, offering excellent value for standard everyday handling operations. Powered Pallet Trucks –The pedestrian pallet trucks P1.6-2.2 and 5-3.0, the shelf stocker P2.0HL, the rider pallet trucks RP2.0-2.5N, the platform double stacker P2.0SD and the platform pallet trucks P2.0S and P2.0SE. Pallet Stackers –The pedestrian stacker S1.0E and S1.0-1.6, the platform stackers 5S-IL-SL, the rider stackers RS1.2-1.5 and the counterbalanced stackers S1.0-1.5C. For more information on the wide range of Hyster® forklift trucks, Hyster® container handlers and Hyster® warehouse trucks, visit www.hyster.eu. Note. In rare cases, trucks are manufactured in other parts of the world for use in Europe, Middle East and Africa. This entry was posted in Big Trucks, Container weighing, Counter Balance, Demand Flow Technology, Electric, Electric Big Trucks, Electrics, Lithium-ion, Manufacturing, Manufacturing Centres, ReachStacker, Solution, SpaceSaver, Special Truck Engineering, Transmission, Warehousing, XT, Zero Turn Radius Axle and tagged Counter Balance, Craigavon, Hyster, Hyster35X, HysterHUB16, Masate, Nijmegen, Side Battery Extract, Special Truck Engineering, Warehousing, XT. Bookmark the permalink.